Midielders Dave Mulcahy (additional red card suspension) and Chris Shields (4 yellow cards), are both suspended, Also missing is long term injury victim Paul Byrne, and there is a doubt about captain Derek Pender who picked up a groin injury in the Cup replay on Tuesday night. Othrwise Eddie Gormley has a full squad to pick from. 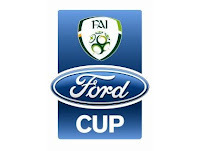 Bray Wanderers have reached the semi-finals of the FAI Ford cup for the first time since 2005. The Seagulls made no mistake this time round seeing off the Longford Town 2-1 at the Carlisle Grounds tonight in their quarter final replay , goals coming from John Flood (12) Chris Shields (26). Derek Glynn pulled one back for midlanders in the final minute. Bray now go into the pot with Sligo Rovers, Sporting Fingal and Waterford United. Eddie Gormley Welcomes back Chris Deans from suspension ,Late fitness tests will be given to Derek Foron and Gary Mc Cabe who both picked up knocks on Saturday night. No decision will be made about their availability until just before kick off. Paul Byrne is still out with a knee problem. Bray Wanderers be part of the dream,be part of the team.